Join the 3 local chapters of Delta Sigma Theta Sorority, Inc., for a Centennial Re-enactment of the Historical Women’s Suffrage March. Saturday, March 23rd. North End of Forsyth Park (Gaston St.). Kick-off at 10 am, walking North to Bull and Bryan Sts. A brief program will be held to commemorate the courage and valor of the 22 collegiate founders of Delta Sigma Theta Sorority who was the only African American organization to participate in the March. 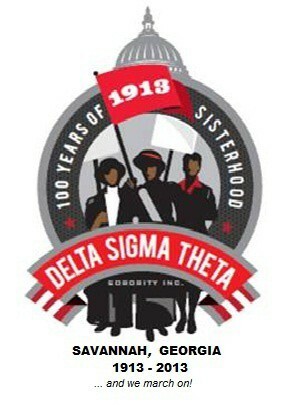 The March is part of the Sorority’s Centennial observance and will also celebrate the enfranchisement of women. Women’s organizations, female youth groups, female community leaders, elected officials, and citizens are invited to join the re-enactment March. Call or e-mail: 912- 232-6048; savannahalumnaenews@gmail.com. Female leaders, organizations, youth groups & citizens are invited.